Why should you consider Civil War map activities for your kids? Instead of lecturing your students about the American Civil War or showing them another boring PowerPoint, you should consider hands on, Civil War Activities. How much more excited and engaged would your students be if they were participating in history, rather than just learning facts about it. Probably the most important thing to learn about the American Civil War is the reason it started and the circumstances leading up to the first shots being fired on Fort Sumter. With the American Civil War Simulation, your students get to make the critical choices that were faced by Grant and Lee, Lincoln and Davis in the Civil War. One of the benefits of doing a Civil War Map Activity is how students develop an understanding of where geographic landmarks are and locations of states as well. As kids pour over the maps, they strategize and work within the geographical limitations of their particular situation/state on the map. Constantly working over strategy and developing plans builds a template in their minds as to where things are: oceans, seas and mountains to name a few. This also helps create a relationship to the reasons certain strategies were used in the war. 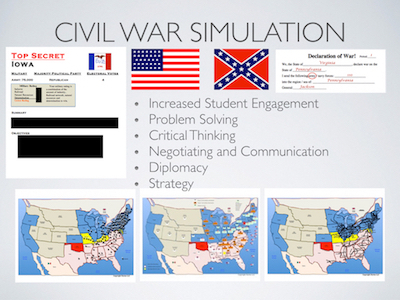 What really drives simulations like this are the objectives that each student has. Students are playing roles of leaders of states and have to make decisions based on ever-changing circumstances. Because other students in the classroom are trying to achieve the same objectives or stop others from completing their objectives. This interaction between students creates a lot of substantive conversations, not only between students but also with teachers and parents. The role that natural resources played in the Civil War cannot be overstated. With the Northern states having their own supplies of resources, the Southern States did not have them. This forced the South to get resources from overseas from European countries. Withe the United States Navy firmly in the hands of the Union, a naval blockade will severely cripple the Confederacy’s ability to gain the resources they need. Unlike many Civil War Activities, this one takes the logistics of conducting a war into account. With a Civil War Map Activity, geography plays the role it did in the real War. Access to railroads is another logistical problem that had a huge impact on the war and again a problem the South had to deal with. Inside the Northern territories was vast railroad network linking all the Northern states together. This made the transport of troops, supplies and war materials faster and more efficient. The new, online platform makes the teacher’s job much more streamlined and gives them time to observe and interact with students. In conclusion, if your looking to get your students engaged, then using Civil War Activities are the way to a more interactive classroom and a dynamic learning environment. North or South. Union or Confederate. Freedom or slavery. What do all of these things have in common? You guessed it…the American Civil War. The American Civil War start was in 1861 lasted until 1865. The United States was divided between North and South and a war was fought all across the United States. The journal, “Live The Adventure,” says that there are three main reasons why the Civil War is something very important for kids to understand. The first of the three reasons is that the Civil War was perhaps the greatest event in our country’s history. It is believed to be one of the single most important events because it completely reshaped our nation. America was divided between the North and the South, the biggest difference between the two “sides” being the practice of slavery. But according to the “Live The Adventure” journal, the second reason kids need to know the events of the Civil War is to understand that the Civil War was not only about slavery. When most people think of the Civil War, they think of Abraham Lincoln freeing the slaves with the Emancipation Proclamation. Yes, this was a very important and key feature of the Civil War but the conflict of the Civil War did not start because of slavery but rather because of states wanting stronger federal rights and then becoming increasingly angry they were not gaining those rights. When the North wanted to abolish slavery, that is when each territory, North and South, really started to become angry. This anger lead to the start of the Civil War. The third reason that the knowing the Civil War for kids is important is because it gives us an insight as how beliefs and convictions motivate people. As a kid learning about the Civil War, I would always question why so many people had to die at the expense of a disagreement. By studying the Civil War, I have come to understand the role that beliefs and convictions can make when fighting a war. Understanding what caused the Civil War to happen provides many, children and adults, with a deeper understanding of how to better avoid the things that lead to such a divide in our nation. Once the three main reasons as to why learning the Civil War is something that is imperative to understand is understood, we can look at the true history of the Civil War and even come to understand some stunning facts about it. One interesting fact about the Civil War was that one-third of the soldiers that fought for the Union Army were immigrants and every one in ten was African American. During the Civil War, the African American soldiers fighting with the North actually refused their salaries for 18 full months in an effort to protest being paid lower wages than that of the white soldiers. The Union Army was fighting for freedom and equality of the slaves being kept in the South, usually African Americans and yet, they refused to pay their soldiers equal amounts. I think that this is another example of the third reason as to why learning the Civil War is important. Seeing that there was still segregation in the North, even when those soldiers were fighting to abolish that, shows us what beliefs and convictions about certain people can do. Another surprising fact about the Civil War is that even before the war started, Abraham Lincoln pushed to send freed slaves abroad. Even before the push to free the slaves, Lincoln was pushing to free the slaves. But because of the push to free the slaves and territorial disagreements, a war swept the United States. Another surprising fact about this war is that more men died in the Civil war than any other American conflict. That includes WWI, WWII, Vietnam War, etc. Knowing and understanding what happened during the Civil War is a very important thing to learn. By understanding, we as a nation, can better avoid any conflicts within our country that would lead to something like this.